Three portraits of Alana Bennett's interpretation of the ballroom gown worn in "Scarlett" (1994) miniseries. 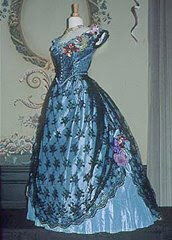 The ballroom gown worn by actress Joanne Walley-Kilmer in "Scarlett" the miniseries (1994) from the Winterthur.org site (Fashion in Film). 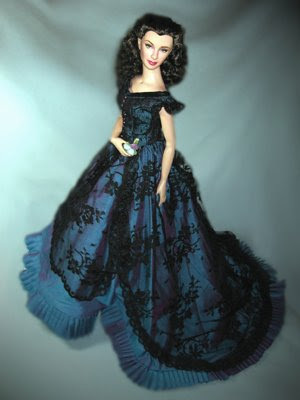 Last year, I emailed Alana Bennett with the idea of having a gown made for my Tonner Scarlett. There are a lot of possibilities in costuming this doll from Victorian to post-Victorian to even modern day dresses. 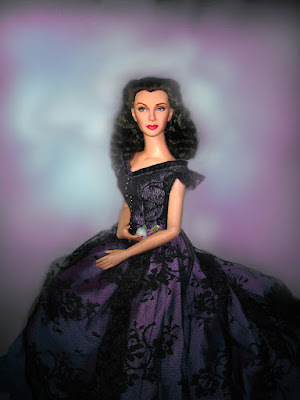 I thought of having a gown done close to the theme of GWTW but one that has never been seen in the film. "Scarlett", the miniseries was replete with wonderful gowns and dresses which were in period, and in my opinion were truthful to the way dresses were made in that era. Unlike the movie Gone with the Wind, I think these were more accurate. Sadly, "Scarlett" in the miniseries, had so many costume changes it was so hard to keep track of their detail. I found a photo of this gown in Winterthur.org site which featured an exhibit of fashion in film. Alana was most interested in doing this gown upon presentation to her. I was actually amazed at how beautiful it came to be. It is not a direct doll version of the gown but it definitely gives the doll an elegance befitting of the character it represents. Alana gave me additional gloves, pantalents, a nice beaded night bag/purse and hooped skirt with it. A great value for a dress that didn't cost so much. The costume designer for Scarlett TV was the great Marit Allen ("Brokeback Mountain", "The Secret Garden", "Love in the Time of Cholera", etc). For Scarlett, Ms. Allen earned the Outstanding Individual Achievement in Costume Design for a Miniseries or Special. A refined woman whose attention to detail is evidenced in the research she did for the miniseries and her other works. Ms. Allen died of brain aneurysm in November 26, 2007 at the age of 66. 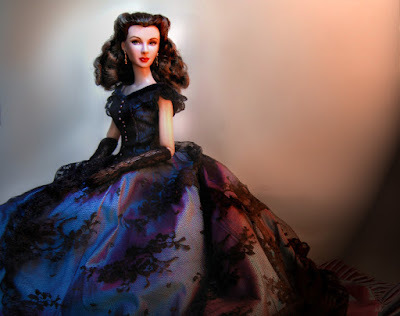 Alana Bennett continues to do wonderful fashions for dolls. Visit her website at www.dollfashionsbyalana.com. You must stop, I cannot afford another doll dress, lol! I LOVE this one. The fabrics Alana used are gorgeous, and I adore the pleated detail on the bottom. I did enjoy the costumes in Scarlett very much. I too have many of Alana's gowns and can attest to her workmanship, if anyone is interested!